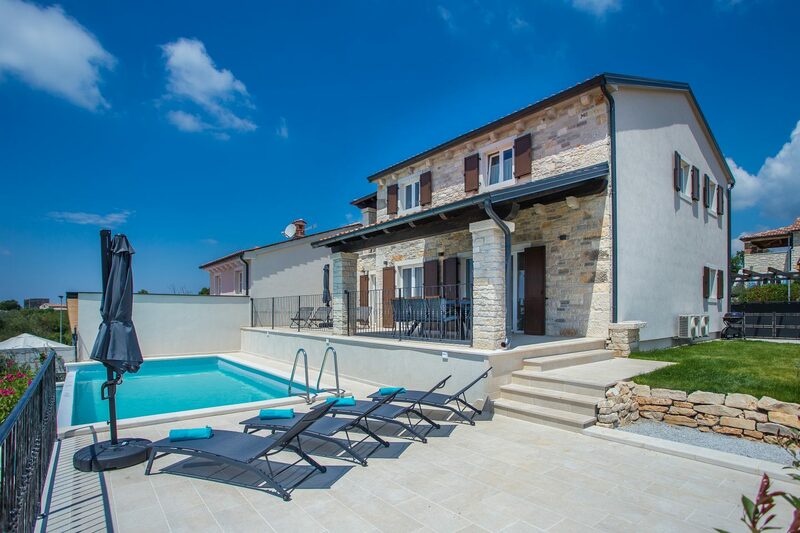 Villa Bellevue is a newly built villa situated on an elevated position with wonderful panoramic view of the west coast of Istria and the sea. The villa lies on the edge of the picturesque village Sveti Lovrec, 15 km from Porec and 20 km from Rovinj. On its own enclosed property of 500 sqm with well-kept lawn it offers to the guests an infinity swimming pool of 32 sqm, spacious covered terrace with sitting area, barbecue, sun chairs, outdoor shower and two parking spaces. Villa Bellevue for 8 people of 200 sqm on two floors is fully air conditioned. On the ground floor there is a living room with sofa, satellite TV, dining room with dining table, fully equipped kitchen, here is also a double bedroom and a shower/toilet. On the first floor are three bedrooms, all with private bathrooms, two of them with access to the shared balcony with sitting area. Wir haben uns super wohl gefühlt. Das Haus ist frisch renoviert, sauber und wunderschön. Die Gastgeberin ist sehr lieb und aufmerksam. Wir kommen gerne wieder.